St. Mary the Virgin is the Mother of God; Theotokos. (Luke 1:43). She was the seed of David (Romans 3:1); the bride-to-be of Joseph (Matthew 1:18-25); kinswoman of Elizabeth the mother of John the Baptist (Luke 1:36); attended to ceremonial purification (Luke 2:22-38); fled into Egypt with Joseph and Jesus (Matthew 2:13-15); lived in Nazareth (Matthew 2:19-23); took twelve-year old Jesus to the temple in Jerusalem (Luke 2:41-50); at the wedding in Cana of Galilee (John 2:1-11); concerned for Jesus’ safety (Mt 12:46, Mk 3:21-31, Luke 8:19-21); at the cross where she was entrusted by Our Lord Jesus Christ to care of John the Evangelist (John 19:25-27); in the Upper Room with the disciples where the Holy Spirit came down upon them (Acts 1:14). St. Mary’s parents, Joachim and Anne, were righteous people in front of God. They prayed earnestly asking God to grant them a child. Six years after they were married, they had Mary, and they knew that she was a special gift from God. They gave her the name “MARY” which means “Royal Incense” because she would become a special offering to God. When Mary was three years old, Joachim and Anne took her to the temple and dedicated their child to God. She spent nine years in the temple. When Mary was twelve years old, Zacharias the priest wanted to find a suitable man who could take care of her. He gathered the canes of her male relatives, and put them in the temple. The next day the cane of Joseph the carpenter budded, just like Aaron’s rod in the Old Testament (Numbers 17:8). So Mary and Joseph became engaged. • The archangel Gabriel announced to St. Mary saying, “The Holy Spirit will come upon you, and the power of the Highest will overshadow you; therefore, also, that Holy One who is to be born will be called the Son of God” (Lk 1:35). • Elizabeth said to St. Mary, “But why is this granted to me, that the mother of my Lord should come to me?” (Lk 1:43). • Isaiah prophesied concerning St. Mary and said “Behold, the virgin shall conceive and bear a Son, and shall call His name Emmanuel.” (Is 7:14 and Mt 1:23). According to Acts 7:49, “Heaven is My throne, and earth is My footstool“, God dwells in heaven, and therefore we call St. Mary the ‘second heaven‘ because God descended and dwelt within her. St. Mary carried bore our Lord Jesus Christ, the ‘Sweet Aroma‘. On another point, the union, within the censor, of charcoal and fire, symbolizes the unity between the Divinity and Humanity of our Lord, and thus we call her the ‘golden censor‘ because she carried the incarnate God in her womb. Moses saw a burning bush that was not consumed, “And the Angel of the Lord appeared to him in a flame of fire from the midst of a bush. So he looked, and behold, the bush burned with fire, but the bush was not consumed” (Ex 3:2). The fire is a symbol of God, “For the Lord your God is a consuming fire” (Deut 4:24), and the burning bush, which was not consumed by fire, is a symbol of St. Mary, who carried the fire of the Divinity in her womb and was not consumed by it. In the fraction of advent, the priest says ‘She being virgin, gave birth to Him, and her virginity is sealed.‘ We believe that St. Mary’s virginity existed before, during and after the birth of our Lord Jesus Christ. Ezekiel prophesied regarding her virginity and said “Then He brought me back to the outer gate of the sanctuary which faces toward the east, but it was shut. And the Lord said to me; this gate shall be shut, it shall not be opened, and no man shall enter by it, because the Lord God of Israel has entered by it, therefore it shall be shut.” (Ez 44:1-2). This closed gate is a symbol of St. Mary’s perpetual virginity. “Then he dreamed, and behold, a ladder was set up on the earth, and its top reached to heaven; and there the angels of God were ascending and descending on it.” (Gn 28:12) This Ladder is a symbol of St. Mary because our Lord Jesus Christ came down from heaven to earth by taking flesh through her, and thus she was the junction between heaven and earth. Our Lord Jesus Christ is the ‘True Manna’ Who descended from heaven and gave life to the world- “This is the bread which came down from heaven-not as your fathers ate the manna, and are dead. He who eats his bread will live forever.” (Jn 6:58). Thus St. Mary is the ‘golden pot‘ who carried the ‘True Manna’ in her womb (Ex 16:32-33). “…and behind the second veil, the part of the tabernacle which is called the Holiest of All, which had the golden altar of incense and the ark of the covenant overlaid on all sides with gold, in which were the golden pot that had the manna, Aaron’s rod that budded, and the tablets of the covenant; and above it were the cherubim of glory overshadowing the mercy seat.” (Heb 9:3-5) This Ark was overlaid on all sides with gold, and this is a symbol of St. Mary’s purity that is like the pure gold. It contained the manna, which is a symbol of Jesus Christ, the ‘Living Bread‘, and the tablets of the covenant, which are a symbol of Jesus Christ the Word (Jn 1:1). It also had placed above it the cherubim of glory, overshadowing the mercy seat, which is why in the icon of St. Mary we see angels overshadowing her. The angel of God announced the birth of St. Mary to her father Joachim; he and his wife were filled with joy and vowed their daughter to the Lord. The Church celebrates this event on 1 Pashons. This is celebrated by the Church on 3 Koiahk; it is the day on which she entered to worship in the temple in a place especially for virgins – she was approximately 3 years of age. This commemoration is on 21 Tobe. On this occasion the Church also commemorates the miracle which occurred on that day. The disciples surrounded her, except for St. Thomas who was preaching in India. This is on the 21st day of each Coptic month and commemorates her passing away on 21 Tobe. The Church celebrates this on 16 Mesore. This is preceded by the fast of the Virgin Mary which lasts for two weeks. This is on 21 Paone and we commemorate on it the miracle of the release of St. Matthias, the Apostle, from the chains which he was bounded. On this occasion we also celebrate the building of the first church in her name in Philippi. Her appearance at El-Zeitoun upon the domes of the church of Saint Mary.This occurred on April 2, 1968 (24 Paremhotep) and continued for many years. In addition to all of this, we celebrate for the entire month of Koiahk with praise, honoring Saint Mary. The feast of her entry into Egypt, with our Lord Jesus Christ and Joseph. This is celebrated by the Church on 24 Pashons. This is one of the feasts of our Lord, but we consider that Saint Mary was associated with it because of her presence with Him. For two thousand years the Church has preserved the memory of the Virgin Mary as the prototype of all Christians: a model of what we are to become through Christ. St. Mary was truly pure and unconditionally obedient to God. The tradition of the Church holds that St. Mary remained a virgin all her life. While lifelong celibacy is not a requirement for all Christians to follow, St. Mary’s spiritual purity (her whole-hearted devotion to God) is certainly to be emulated. St. Mary is also our model in that she was the first person to receive Jesus Christ. Because she bore Christ in her womb physically, all Christians now have the privilege of bearing God within them spiritually. The honor we give to St. Mary also signifies our view of who Jesus is. 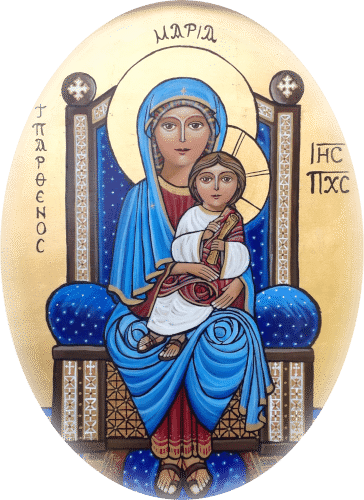 From early times the Church has called her Mother of God (Theotokos), a title which implies that her Son is both full man and full God. As His mother, she was the source of His human nature; even though the One she bore in her womb was the eternal God. Therefore, because of her character and her role in God’s plan of salvation, we appropriately honor St. Mary as the first among the saints. The archangel Gabriel initiated his honor to her when he addressed her with the good news of the Annunciation, as did Elizabeth (Lk 1:28,42). St. Mary herself, by the inspiration of the Holy Spirit, predicted the honor that would be given to her throughout history (Lk 1:48). In obedience to God’s clear intention, our Church honors St. Mary through icons, hymns, and special feast days. We entreat her as the human being who was most intimate to Christ on earth, to intercede with her Son on our behalf. We ask her, as the first believer and the mother of the Church, for guidance and protection. We venerate her, but do not worship her. For worship belongs to God alone. We remember her in all of our prayers, which gives her an unique place in our church and hears. We still remember her miracles and her awesome apparel in our churches.